The SI Vault published 28 photographs of athletes from their high school yearbooks today. 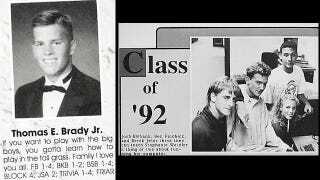 There are plenty of highlights—Brett Favre's mullet, Barry Bonds's jheri curl, and Mark McGwire's poignant senior quote, to name a few—but our personal favorites feature young, awkward Derek Jeter and young, awkward Tom Brady, before they were really Derek Jeter and Tom Brady. Jeter poses with three classmates, preparing to "teach Stephanie Weidler a thing or two about running her computer" (1992: when sexual innuendo had not yet met The Internet). And Brady's senior quote is all bravado: If you want to play with the boys, you gotta learn how to play in the tall grass. He always did come off as the strong-and-almost-totally-silent type. I guess the ponytail came with marriage. Thanks for your continued support of Deadspin. Monday's in the books.